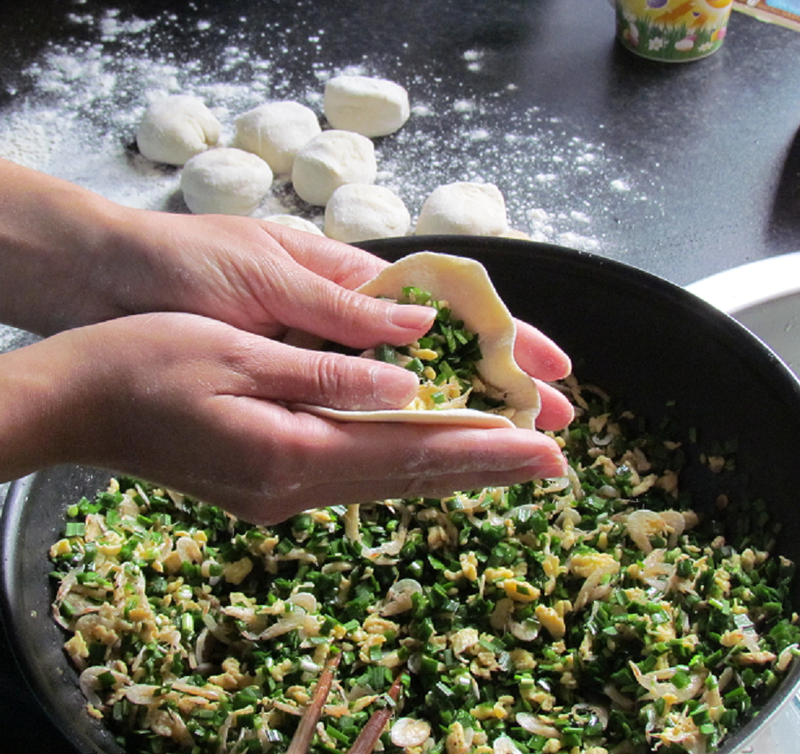 Pan Fried Vegetable Pie (Cai He Zi) is a common home-made dish in Northern China. 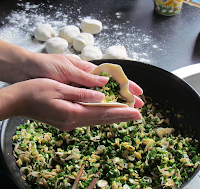 It’s a popular dish, especially the ones stuffed with Chinese chives and eggs. It has been one of my favourite dishes since I was a little girl. 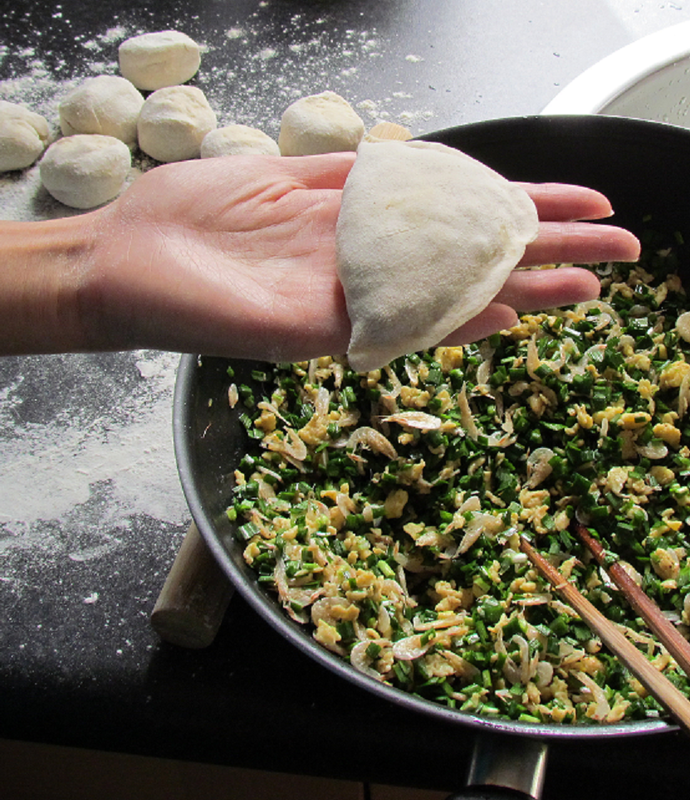 The first time my husband visited my family, my Mum made him Cai He Zi, and of course he felt in love with this ‘big fried dumpling’. Since then every time we go over to parent’s, when my Mum ask him what would he like for dinner, ‘He Zi’ is answer No.1. Place the plain flour in a big bowl, add hot water (about 70℃), mix and knead until it forms a soft dough. Cover the bowl with wet towel and let it sit for 30 minutes. Crack the eggs in a bowl, mix well. Heat up a wok with 3 tbsp of cooking oil over strong heat. When the oil is hot, pour the eggs in. Keep stirring until they become small pieces, turn off the heat. Wait for the eggs to cool down, put the dried shrimp in, add 3 tbsp of cooking oil, five spice powder, prickly ash powder and sesame oil. Mix well. 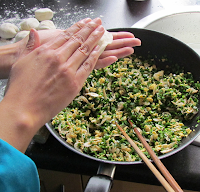 Cut the Chinese chives into small sections about 0.5cm long. Put them in the wok, add salt and mix well. Take out the dough, knead and make it soft. Make the dough into an even and smooth stick shape. Cut into 3cm diameter pieces. Squash the pieces by hand first, then use the rolling pin to roll them into oval shaped wrappers. Remember to roll from the edge to the center and always keep the center bit thicker than the edge. Put some stuffing on a wrapper and wrap it up. Make sure the edges are finely pinched close so the pie won’t open up during frying. Gently flatten the pie on the side. Heat up a pan with 2 tbsp of cooking oil over strong strong heat. When the pan is hot, turn to low heat, put the pies in to fry. 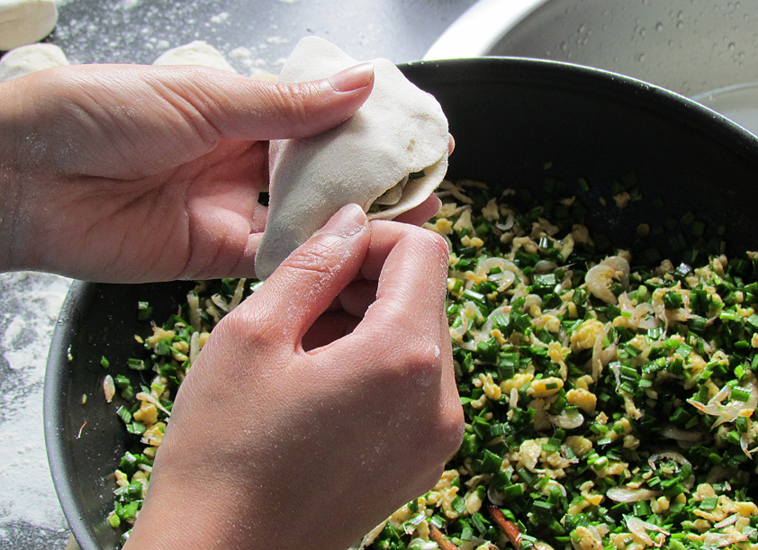 Keep turning over until both sides become crispy and golden brown in colour. Take out and ready to serve. 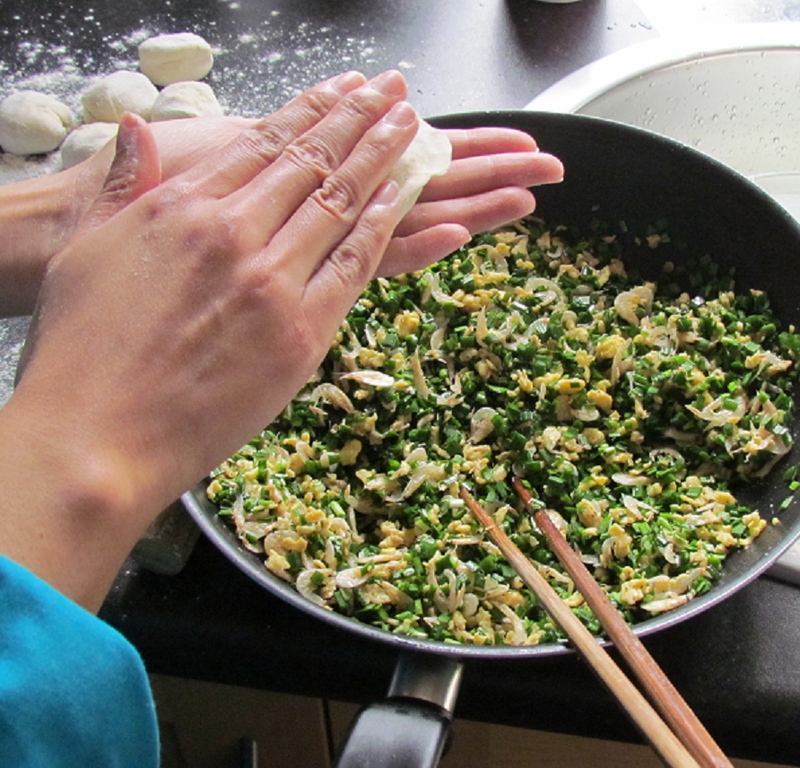 You can use other kinds of vegetables instead of Chinese chives. For example, cabbage, spinach, courgette, etc. 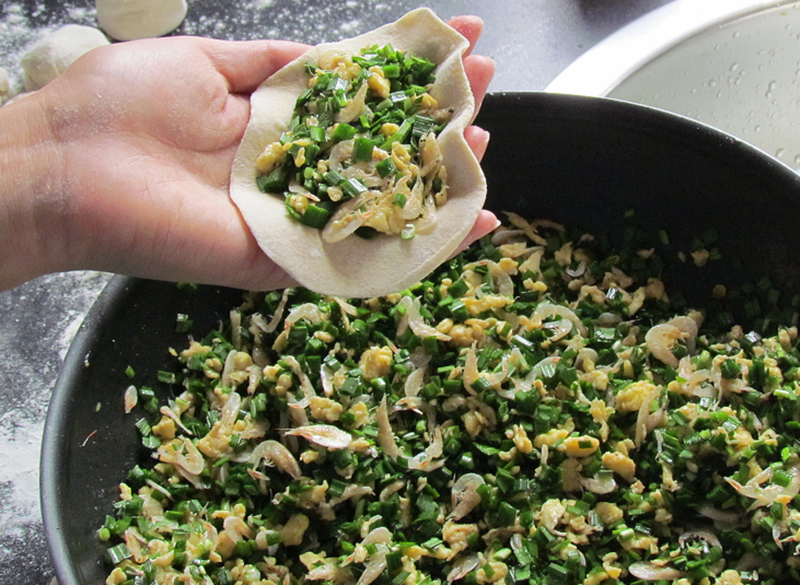 Dried shrimp is optional, or you can use chopped prawns or meat mince instead. Just note that the dried shrimp is salty. If you are not using them, you should add more salt while making the stuffing.